DC has solicited horror comics, western comics, sci-fi comics, war comics and spy comics. So, it’s not surprising that in their huge line-up for the reboot, they’ve found space for a fantasy comic. What’s more, it looks like it’s a good ‘un. Paul Cornell, known in comics mostly for the recent Lex Luthor led run Action, spends most of the issue laying the scene and introducing the protagonists: our Demon Knights. He paces the whole thing quite effectively, so that there’s more than you’d think packed into the twenty pages, though it doesn’t feel remotely slow or over talky. The crisp art of Diogenes Neves helps with the pace, with big bold images, whose detail does not detract from the viewing experience. In fact, the scenes rush by quite quickly, introducing us to named cast - primarily Jason Blood and his alter-ego, the Demon Etrigan and his lover, Madame Xanadu. These two (or three, depending on your point of view) were cast together after the fall of Camelot and have been apparently doing typical fantastic deeds through the centuries. 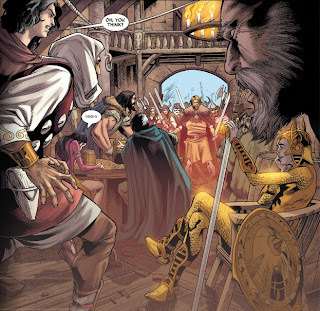 Now, though, they decided to stop for a drink in a small town that stands in the way of a marauding barbarian horde lead by the Questing Queen and Mordu - whose evil is established pretty quickly and effectively. 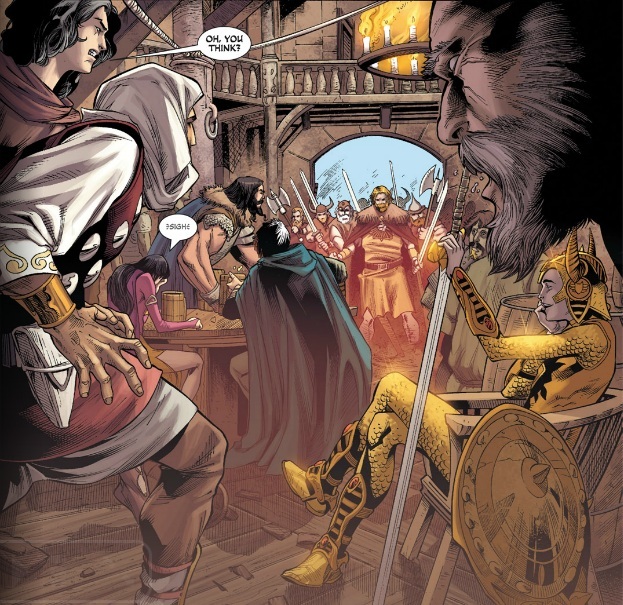 The seven protagonists (for the record: Etrigan & Xanadu, Vandal Savage, Morrison’s version of the Shining Knight, an Amazon named Exoristos, an Arabic scientist called Al Jabr and a mysterious archer) are drawn into fighting the horde in a setup that smacks vaguely of The Seven Samurai or Magnificent Seven. But it all comes together into a fun mix, with dialog rushing along smoothly with fun and relish. It’s one of those reads you’ll fly through and get to end quite suddenly - at once disappointed that it’s done, but pleased with how exciting the ride has been. And promises to continue to be.